Exchange House Travellers Service is delighted to announce that we are offering an Auricular Acupuncture service for clients with addictions or family members affected by substance misuse. The Family Support Team completed training, funded by the South Inner City Drugs Task Force, with the National Acupuncture Detoxification Association to provide this treatment. To date, the response from our clients has been very positive. This treatment, which concentrates on five specific points on the ear, is regarded as one of the most effective forms of treatment for management of stress and addiction. 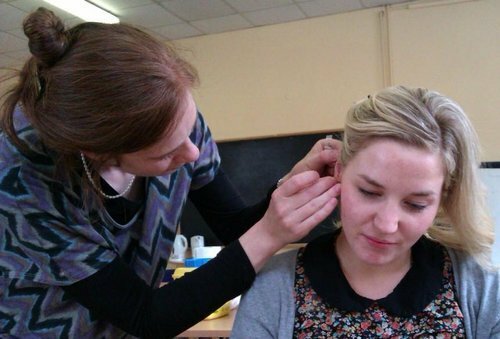 The benefits of Auricular Acupuncture were first identified in Hong Kong in 1972 and it has been used worldwide since then. Effects of the treatment include a reduction of cravings or withdrawal symptoms for substances such as alcohol, drugs and cigarettes, marked relaxation, pain relief, improved sleeping patterns and a feeling of well being. The duration of the treatment is 20 – 45 minutes. Smoking needles, which help to reduce cravings for nicotine, and Wellness Seeds or “Stress Balls”, which have been found to reduce stress levels, are also available. “Its very good, it makes you relax, improves sleep and energy levels – I feel more comfortable with myself and being around others” says Tom. “Its very relaxing, I feel more calm, stress levels go down, I’m more positive. I’m looking forward to doing it again” says Martin. A weekly group session for clients of Exchange House Addiction Service and their family members will be held at Exchange House Travellers Service, 61 Great Strand Street, Dublin 1 on Wednesdays from 12pm – 2pm. Alternatively, should you wish to avail of this treatment on an individual basis please phone 01 872 1094 to make an appointment.